All girls at Our Lady of Good Hope Parish are invited to bring their father (grandfather, godfather, etc.) 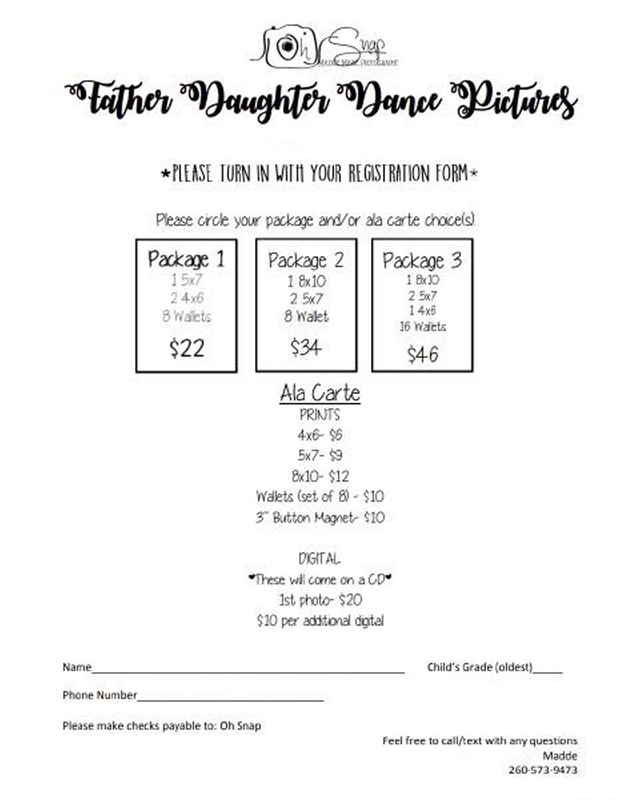 to a Father/Daughter Dance on Friday, January 25, from 7-9 pm in the gym. Sponsored by the Our Lady School Home and School Association, this event will cost $20 per couple/family. You can receive $5 off your ticket price by diapers (size newborn-size 2), soap, shampoo, or toilet paper to A Mother’s Hope. Donations can be dropped off with payment at the school office or with payment at the door. Snacks and refreshments are included in the ticket price. Checks may be written to: Our Lady School. In addition, Oh Snap! Maddie Marie Photography will be offering optional father/daughter portraits onsite for an additional fee. Registration forms for the dance and picture order forms can be picked up in the school office or downloaded below. Please contact Gina Tippmann or hasa@ourladyfortwayne.org with any questions.